Russellville Middle Schooler, Natalie Saenz, was selected as a runner-up in the Altice USA Hispanic Heritage Month Essay Contest. To celebrate Hispanic Heritage Month earlier this year, Altice USA launched an essay contest with the prompt, “Name a Latino, past or present, with whom you’d like to spend a day with and why? ", and middle and high school students across the company's service areas were invited to participate for the opportunity to win scholarships and other prizes. 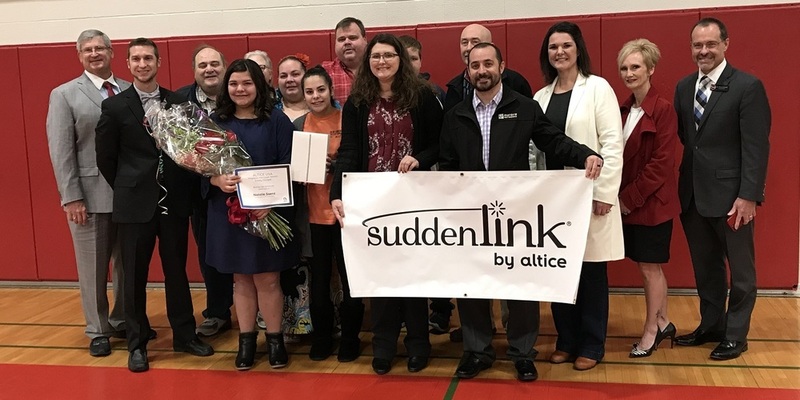 Natalie is one of three finalists to represent the middle school age group for all of Altice USA's Suddenlink service areas. This week, Russellville Mayor Randy Horton, Superintendent Dr. Mark Gotcher, Principal Bryan Swymn, members of Natalie’s family, students, and Altice USA's Suddenlink employees assembled at Russellville Middle School to congratulate and recognize Natalie for her essay submission about her late father, Army SGT. Jesus Saenz. Pictured L-R: Mayor Randy Horton, Principal Bryan Swymn, Natalie Saenz, Suddenlink: Candace Kirkendoll, Ron High, Mike Ederington, Jenny Massey, Kylia Stewart and Superintendent Dr. Mark Gotcher.